Few dishes are as significant as “struffoli” - at least in the Neapolitan area. These fried sweet balls of dough covered with honey and sprinkles immediately evoke Christmastime and represent a pleasant divertissement at the end of meals or on festive afternoons, when one portion leads to another, perhaps paired with a good glass of dessert wine. “Struffoli” were introduced by the Greeks, in very ancient times, when Parthenope belonged to Magna Graecia; in fact, the etymology of the word “struffoli” apparently derives from "strongoulos", that is "rounded", and even today, in Greece, people still prepare a very similar dessert, but made with more elongated shaped balls, called "loukoumades" (delicacies). 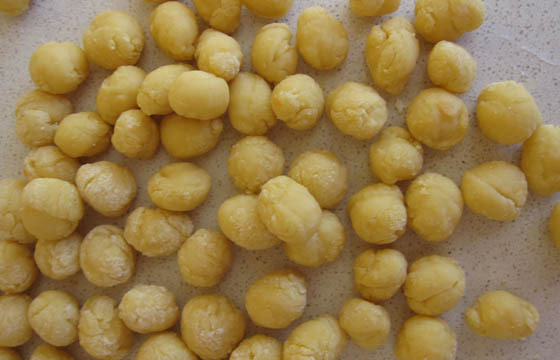 The dessert spread throughout Southern and Central Italy, undergoing slight variations, so in Lazio and Abruzzo it is called “Cicerchiata”, due to the shape of the balls being very similar to that of “Cicerchie” (grass peas) and “Cicerata” in Basilicata and Calabria, while in Sicily it loses an f, becoming “Strufoli”. 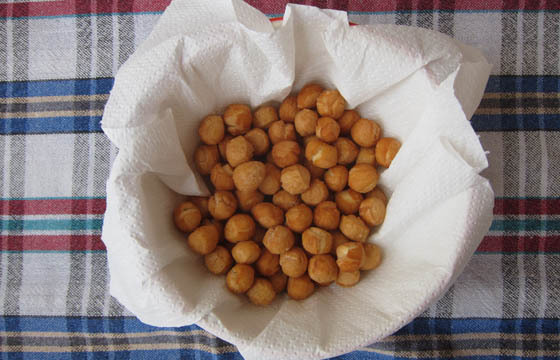 To prepare the “struffoli”, put all the ingredients for the dough into a large bowl, folding in to obtain soft and compact mixture, which needs to be left to rest in the fridge, covered with cling film. 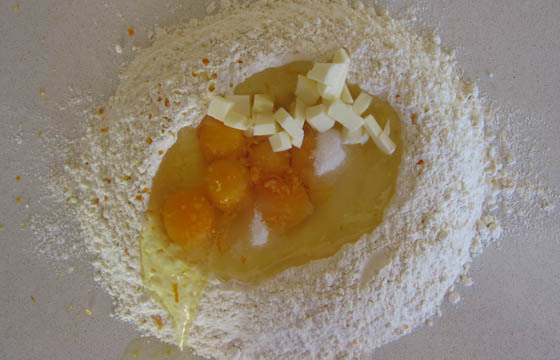 The dough should then be divided into small balls the size of a fist, from which thin strands of dough can be cut and made into small balls. 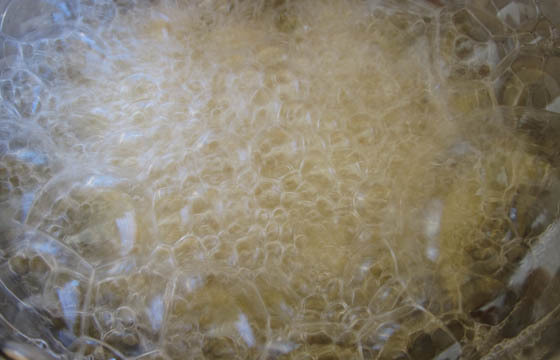 During this part of the procedure, the secret is not to work the dough too much to get the strands, in order to prevent it from cracking during the frying phase. At this point, the balls need to be fried in peanut oil, once it has reached a temperature of 140°C, until they’re lightly browned. Use kitchen paper to absorb the excess oil and leave to cool down. It’s best to only fry a few at a time so that you can better monitor how the cooking is proceeding, and avoid lowering the temperature of the oil too much. 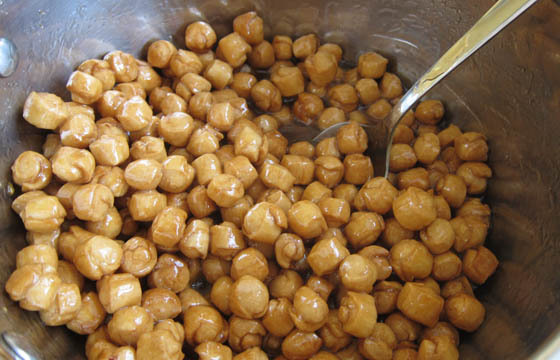 The honeying phase should not be underestimated as it adds sweetness to the dish and, at the same time, the honey coating on the newly fried balls keeps them fresh so that “struffoli” can be kept for a long time, well beyond the Christmas period. First, the honey must be liquefied by simmering it, being careful not to caramelize it - so as to avoid obtaining - once it has cooled off - a very hard block of honey. Put the honey in a steel pot with a thick bottom and simmer it until it reaches boiling point; as soon as it begins to boil, turn off the gas, wait a couple of minutes and then pour it over the “struffoli” that you have placed in a large and spacious container, soo that, when turning them over with a spatula, the honey gets spread over all the “struffoli”. At this point, pour half of the sprinkles and candied fruit – which must be a mixture of orange, citron and above all pumpkin – so that they are distributed evenly over all the balls. 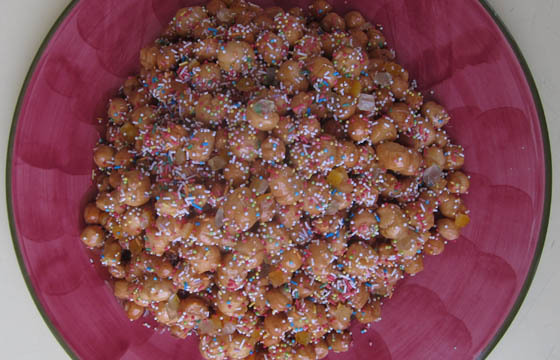 With the honey still hot, place the “struffoli” in a large serving dish arranging them in the shape of a crown – helping yourself by placing a glass at the centre, which you can remove at the end, or in that of a pyramid. Decorate with the remaining sprinkles – the “diavulilli” (in Neapolitan) - and the candied fruit; if you want, you can add silver fennel sprinkles and with candied cherries as a finishing touch.